First, create one user control ("LinkButtonControl.ascx") and copy the following code to that control. 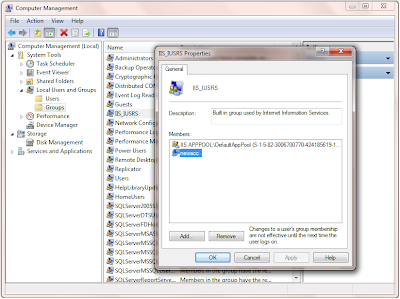 It uses PlaceHolder contron that is to store dynamically added server controls on the Web page. 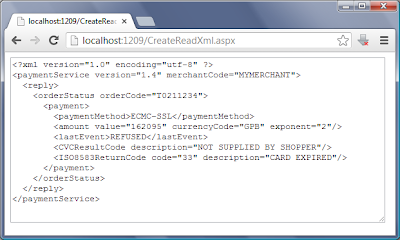 Second, create one .aspx page("UserControlTest.aspx") and add the follow CSS to <head> tag for link button layout. Copy the following code snippet to code-behind for event implementation. 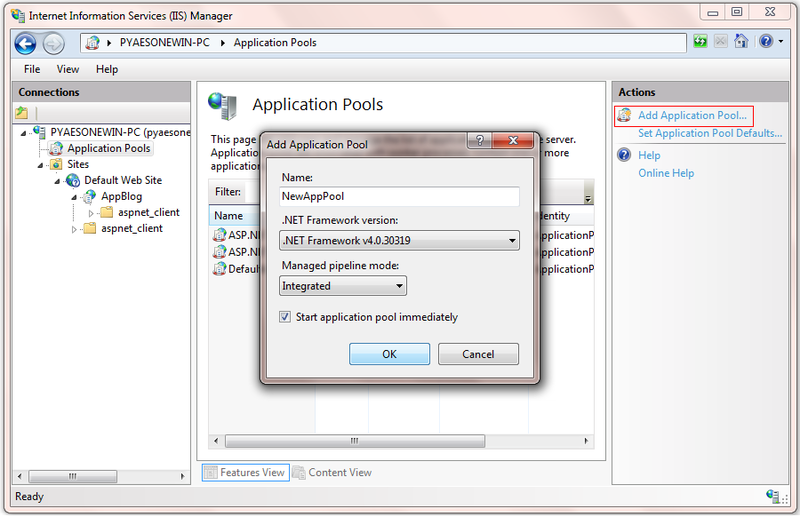 Our web application often need to access local or network resources in production environment. For example, our application have to access file server for read/write access in different domain (not in a domain). 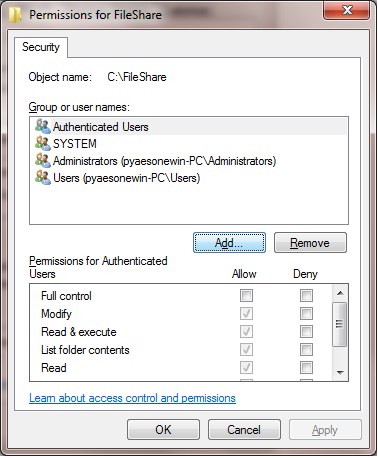 In the above cases, we can use mirrored local accounts known as "Pass-through authentication". With this approach, you use two local accounts with the same user name and password on both servers (such as web server and file server). For network resources in the same domain, see previous post. Let's start here. 1. 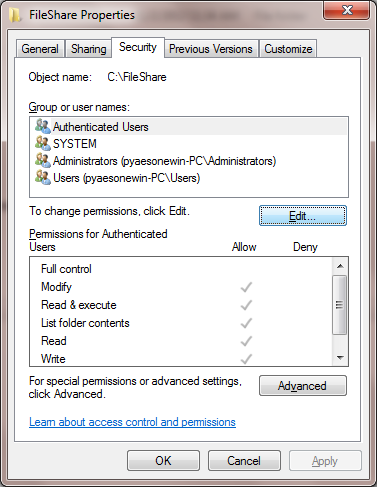 Click Start, select Administrative Tools and click Computer Management. 2. 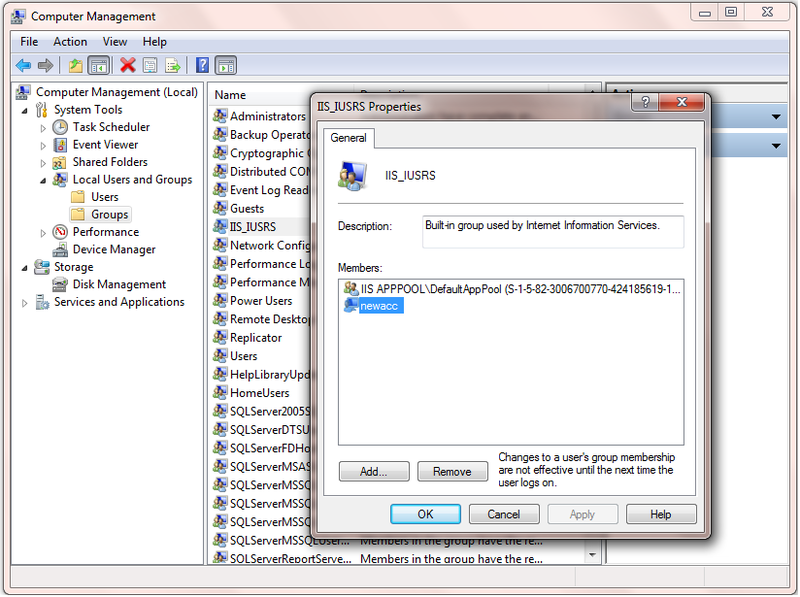 In Computer Management, click Local Users and Groups. 3. 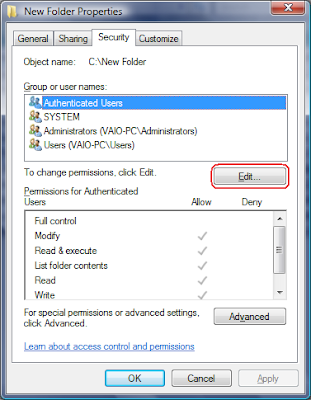 Double click the Users folder. 4. Right click in the users list and click New User. 5. Fill in the information for the new user (e.g. 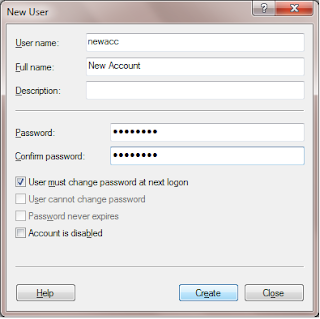 newacc) and click Create. 2. 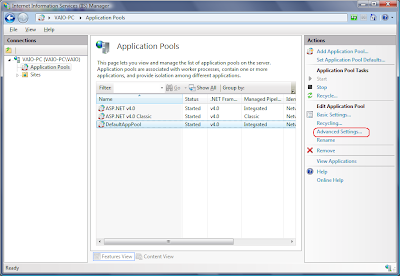 Type the name of new application pool (e.g. 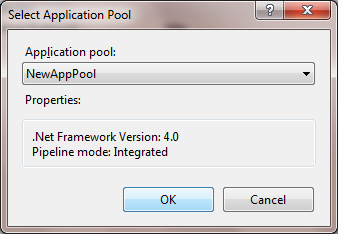 NewAppPool) on Add Application Pool dialog and press OK.
3. 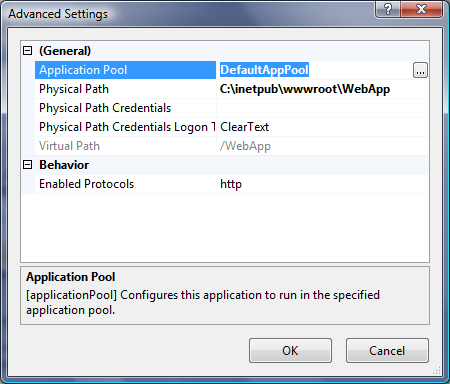 Select new application pool (NewAppPool) under Application Pools node and click Advanced Settings. 4. 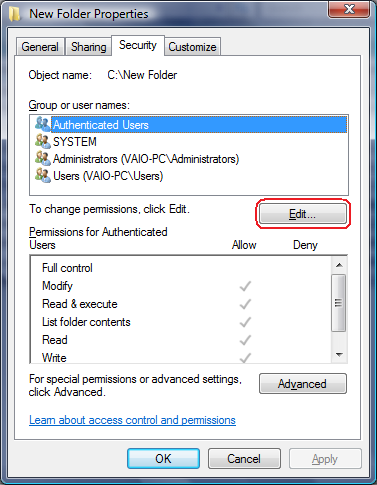 Advanced Settings dialog will appear and select the "Identity" list item and click the ellipsis (the button with the three dots). 5. 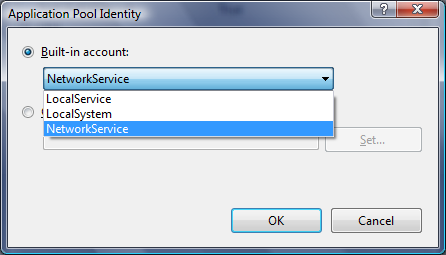 Select Custom account option and press Set..
6. Type the new created account information (newacc) and press OK.
1. 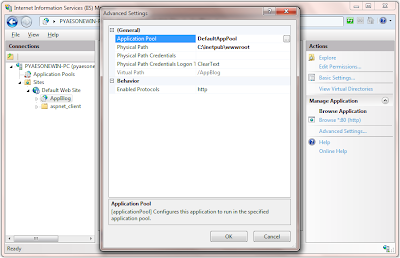 Go to IIS, click on your web application and click "Advanced Settings". 2. Click the ellipsis (the button with the three dots) on Application Pool item list. 3. 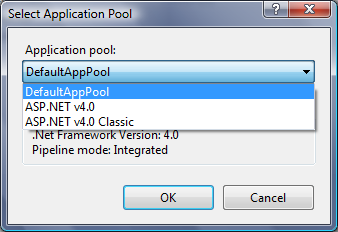 Select the new application pool (NewAppPool) on Select Application Pool dialog and press OK.
1. 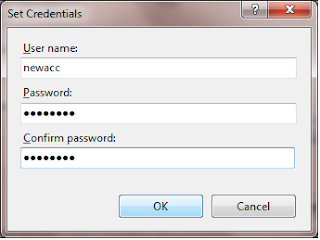 Create a local account with the same username and password as the one in Web Server (Step 1). 2. Right click the folder and select "Properties"
4. 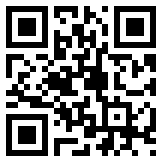 Click Add for new user account. 5. 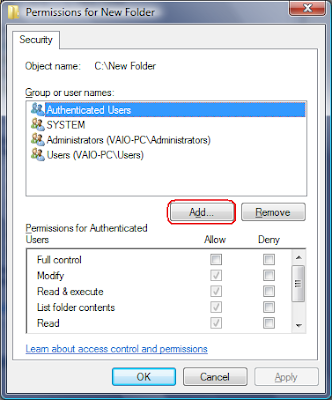 Type the created user account (newacc) and click Check Names and OK.
By doing this, the file or directory you selected in file server will now allow the custom account identity access from your web application in web farm. 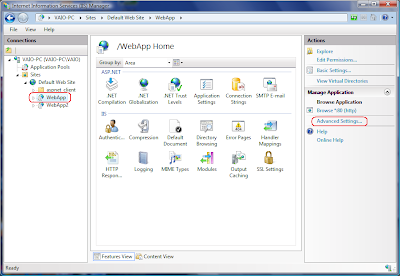 Our web application often need to access local or network resources in production environment. 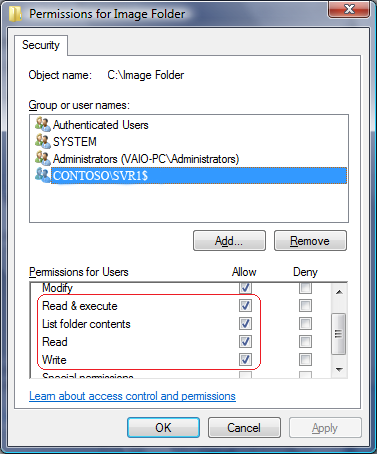 For example, our application have to access file server for read/write access in the same domain. 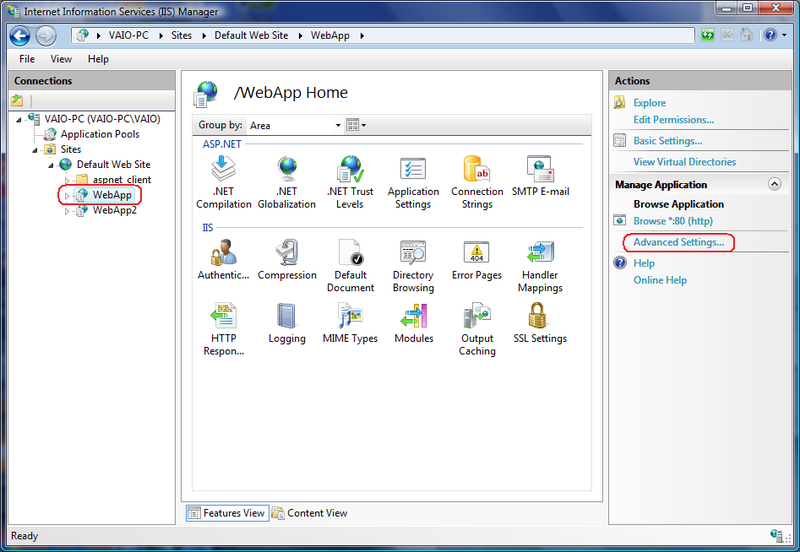 In case, web application upload and save user account photo or document such as excel and word file. At that time, it need the Network Service Account that is least privileged, although it have network credentials which means that you can use it to authenticate against network servers. 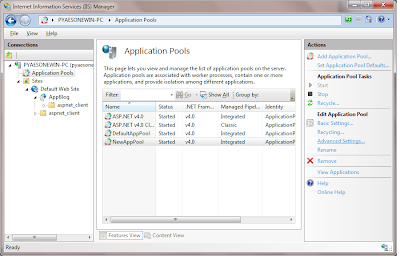 By default, Microsoft Internet Information Services (IIS) 6.0 on Windows Server 2003 runs ASP.NET applications in application pools that use the NT AUTHORITY\Network Service account identity. 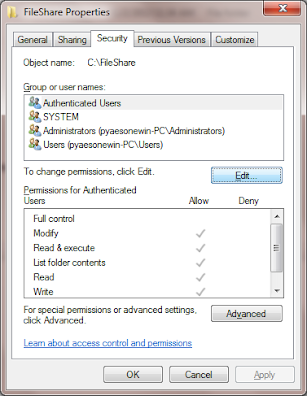 This account is a least privileged machine account with limited permissions and an application that runs using this account has restricted access, network credentials, which means you can use it to access network resources and remote databases by using Windows authentication. The network resources must be in the same domain as your Web server or in a trusted domain. 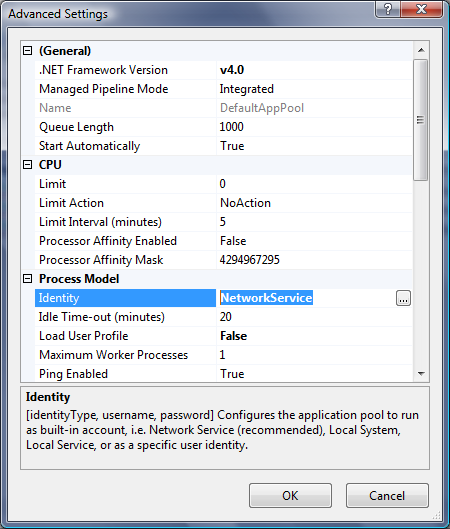 Normally, the Application Pool Identity in IIS7 is "ApplicationPoolIdentity" by default and in IIS5 or IIS6, is "NetworkService" by default. Let's start here, to use the NT AUTHORITY\Network Service machine account to access local and network resources in Web Farm. 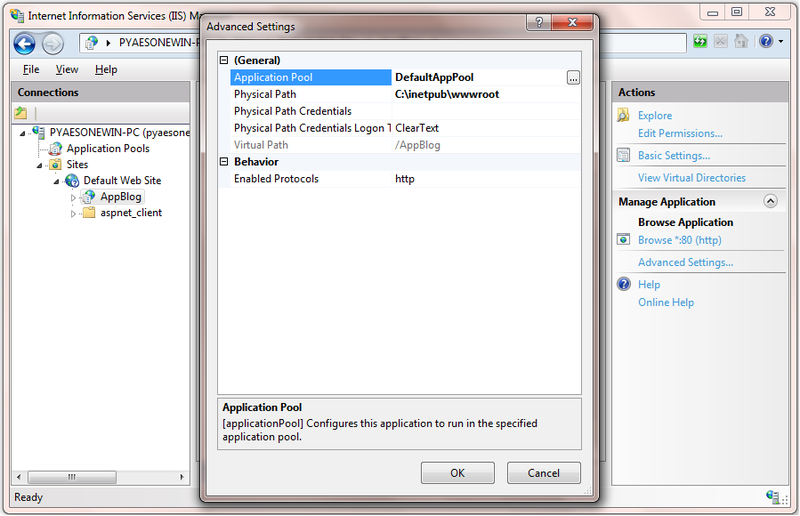 Go to IIS, click on your web application and click "Advanced Settings". Now, you see your application use "DefaultAppPool" Application Pool. If you want to change it to another, click the ellipsis (the button with the three dots). The following dialog appears. 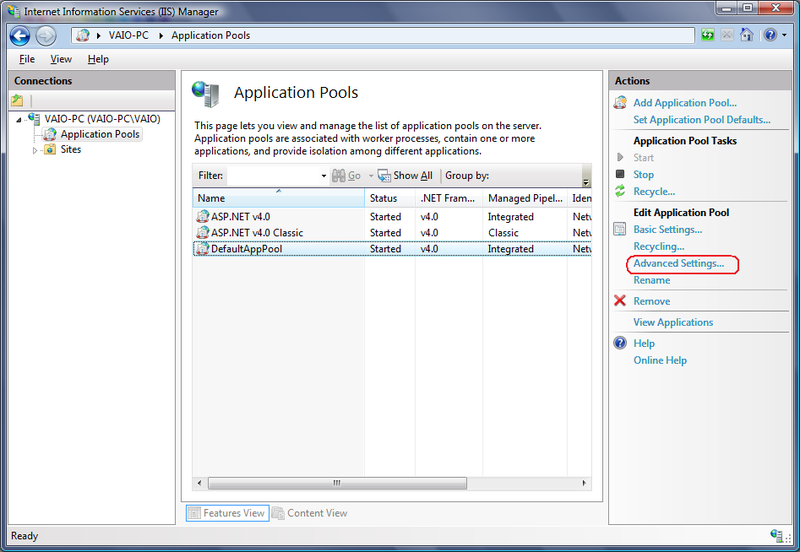 Select the Application Pool you want from the combo box and Press OK button. 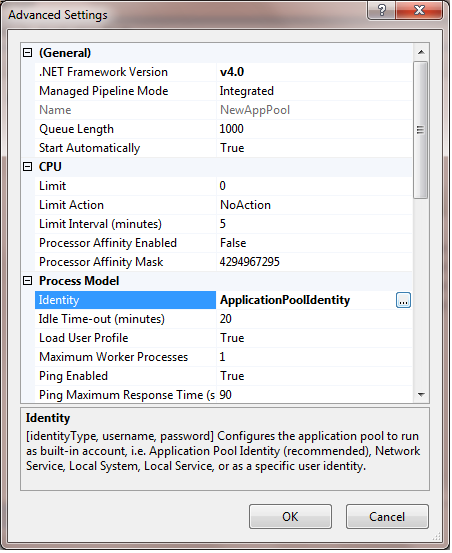 Now, we know already what Application pool we used. 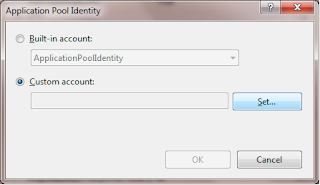 Then we change the Identity Type for Application Pool. Now, Identity is "NetworkService" already. 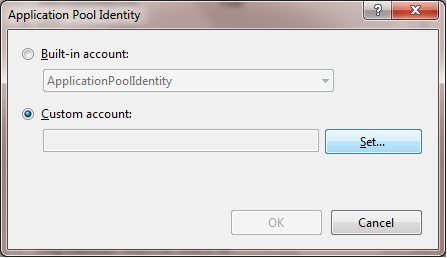 Otherwise, select the "Identity" list item and click the ellipsis (the button with the three dots). The following dialog appears. 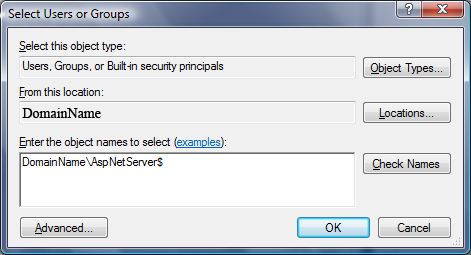 Select the Identity Type "NetworkService" from the combo box and press OK button. 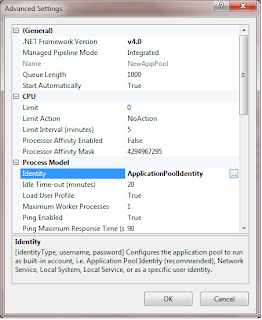 So, we finished marking sure that our web application that run using "NetworkService" Application Pool Identity. 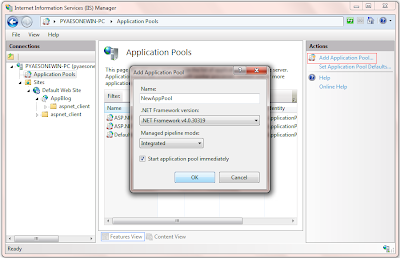 Whenever a new Application Pool is created, the IIS management process creates a security identifier (SID) that represents the name of the Application Pool itself. 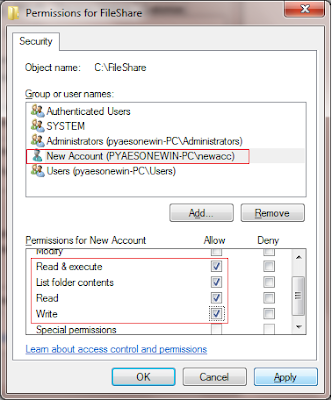 For example, if you create an Application Pool with the name "MyNewAppPool," a security identifier with the name "MyNewAppPool" is created in the Windows Security system. From this point on, resources can be secured by using this identity. However, the identity is not a real user account; it will not show up as a user in the Windows User Management Console. Let's start giving permission to folder in remote server here. 2. Select a file or directory. 3. 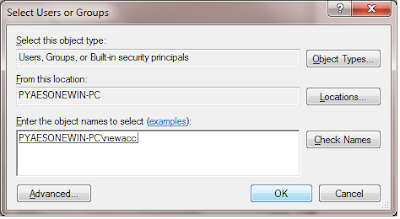 Right click the file and select "Properties"
6. Click "Locatoins" and make sure you select your domain and then enter the Network Service account. 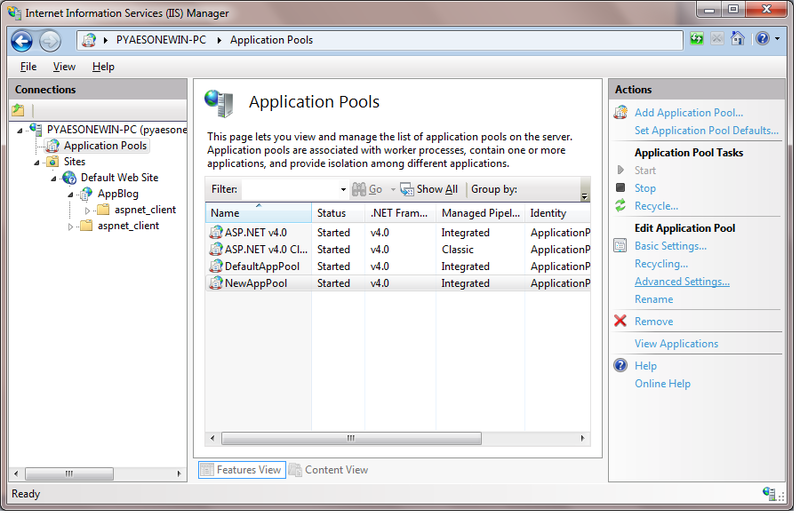 The Network Service account's credentials are of the form DomainName\AspNetServer$, where DomainName is the domain of the ASP.NET server and AspNetServer is your Web server name.For example, if your ASP.NET application runs on a server named SVR1 in the domain CONTOSO, the Network Service account is CONTOSO\SVR1$. 7. Click the "Check Names" button and click "OK". By doing this, the file or directory you selected in file server will now allow the Network Service identity access from your web application.